Recently, I received a sample packet of Pumpkin Flax Granola from Nature's Path in the latest shipment of goodies I got from SampleSource. I have eyed the small package with anticipation for the last couple of weeks, just waiting for the right time to finally open it and dig in. Today was that day and I am actually enjoying the last few nibbles of my sample as I type up this review. "Enriched with pumpkin and flax seeds to offer up an impressive 450 mg of Omega-3 fatty acids and 1500 mg of Omega-6 fatty acids"
All of this sounds great, but let's be honest, how many of us are going to spend our hard-earned money on this product if it doesn't taste good? Well, luckily for us, it is good for our taste buds as it is our bodies. 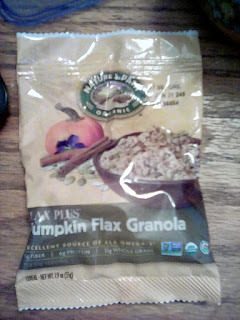 Unlike many granolas that are hard, Nature's Path Pumpkin Flax Granola is very easy to chew. It doesn't contain the heavy coatings and sharp edges that make so many other brands difficult to eat. This granola is packaged in small pieces and comes with a very light coating, which can make it difficult to eat if you're on the go, but not having to gnaw your way through hard clumps is a definite plus! It is the perfect blend of crispy and crunchy thanks to the abundance of flax and pumpkin seeds mixed throughout. But what about the flavor, you may be asking. Well, the flavor is simply fantastic. There is a light sweetness to Pumpkin Flax Granola and a hint of cinnamon, but neither are overpowering. 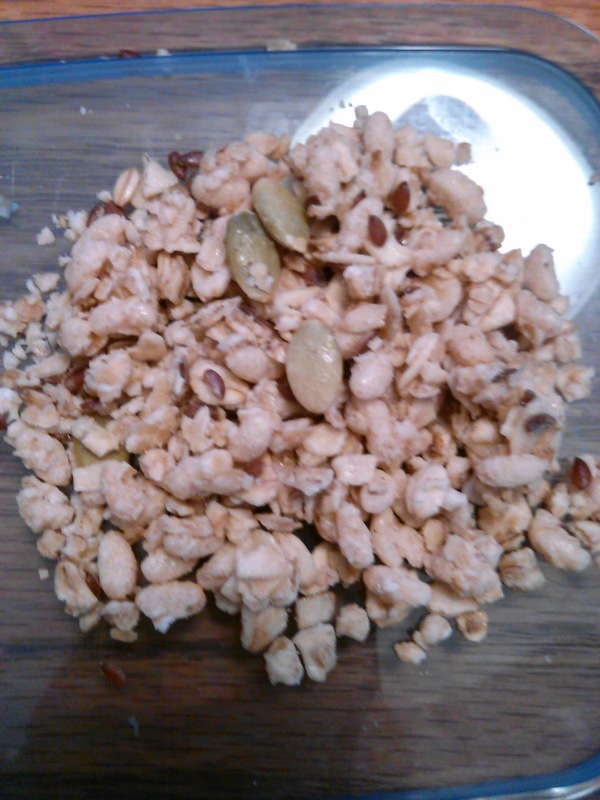 As much as I enjoy both the texture and flavor of this granola, my favorite thing about it is its versatility. It can be eaten straight from the package as a quick and easy, although slightly messy, snack or you can pour it into a bowl and top it with fresh fruit and your favorite milk and enjoy a hearty breakfast. Microwave it for a hot cereal alternative on cold mornings or mix it in with oatmeal or cream of wheat for an added boost in flavor and nutrition. I can also easily see myself stirring it into a cup of yogurt or sprinkling it on top of frozen yogurt, as an ingredient in a parfait, topping on a trifle and so many other ways to incorporate this yummy granola into my every day meals. I love eating granola and have been known to make my own when time allows, but I have weak teeth so eating it can be a painful experience that leaves my mouth and jaw aching for days afterwards. Since trying this product out, I have a very strong feeling that granola is about to become a regular part of my diet instead of being an occasional and painful indulgence. Thank you Nature's Path! I can't wait to try out some of your other products. For more information about Nature's Path, Pumpkin Flax Granola and their other products, please visit their website, Facebook, Twitter, Pinterest, YouTube and Instagram. Disclaimer: I received this sample of Nature's Path Pumpkin Flax Granola as a participant of the Sample Source program. This free sample in no way colored my opinion or affected my judgement of this product. My opinion is my own and free from bias. Why waste your hard earned dollars buying a pre-made pumpkin pie spice mix when you can easily create your own from spices you most likely already have on hand? Combine all ingredients in a small bowl and stir until thoroughly combined. Store in an air-tight container and store away from direct light and extreme temperature fluctuations. If you are looking for a simple pie crust recipe that yields consistent results, look no further! This crust always bakes up beautiful and flaky. I use it for all of my pie and pot pie recipes.This recipe will yield 3 crusts. In a large bowl, combine flour, shortening and salt. Cut ingredients together using a pastry blender or fork until the mixture resembles coarse crumbs. In a small bowl, whisk together egg, water and vinegar then pour into flour mixture. Blend together using a fork or your hands until the mixture comes together and forms a ball. Cover with plastic wrap and store in the refrigerator until time to use. Nothing says "Autumn is here!" or "Happy Thanksgiving" like the smell of pumpkin inspired baked goods. Pumpkin bread, pumpkin pie and the oh so delicious pumpkin roll are seasonal favorites here in Ohio. Local stores can't seem to keep them on hand and restaurants serve them up hand over fist. For those of you who prefer homemade to store bought, indulge in these delicious recipes. Preheat oven to 375 degrees F and grease a 15x10x1 inch baking pan and line with parchment paper. Generously grease and flour paper. Beat eggs on high for five minutes then slowly add sugar and pumpkin. Mix in flour, cinnamon, and baking soda until just mixed. Pour batter in pan and tap several times on counter top to spread it evenly. Bake for 15 minutes and Immediately turn out onto a linen towel dusted with powdered sugar. Peel paper from cake and starting with the short end, roll cake up in the towel. Cool. While cake is cooling, make filling by mixing powdered sugar, vanilla, butter and cream cheese together until smooth.Carefully unroll cake and spread filling over cake. Roll up again. Cover roll and refrigerate until time to serve. Cook's Notes Roll can be garnished with additional powdered sugar or caramel sauce. If desired, sprinkle filling with chopped walnuts or pecans before rolling cake. Preheat oven to 350 degrees F and grease 2 9X5 loaf pans. Cream together butter and sugars, add eggs and mix well. Combine dry ingredients and stir into butter mixture until just moistened. 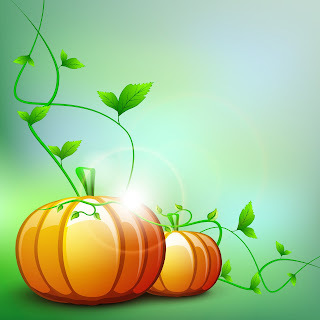 Add pumpkin. Pour into prepared pans and bake for 1 hour to 1 hour 15 minutes (until a toothpick inserted into center of loaf comes out clean). Preheat oven to 425 degrees F. In a large bowl, combine eggs, yolk, and sugars. Stir in spices. Slowly stir in milk and cream and add pumpkin. 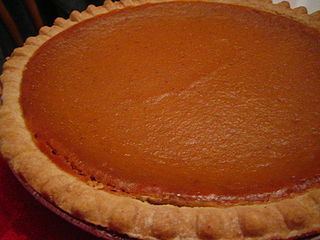 Pour into pie shell.Bake for ten minutes then reduce heat to 350 degrees F and bake an additional 40 to 45 minutes. Cook's Notes The recommended pie crust recipes makes a double crust. You can either cut the recipe for crust in half or double the pie recipe. Preheat the oven to 250 degrees F. Spread seeds in a single layer on a baking sheet and toast for 45 minutes, stirring occasionally, until dry and toasted. While seeds are toasting, mix together 2 tablespoons sugar, salt, and pie spice and set aside. Heat the butter in skillet and cook seeds remaining sugar over medium high heat until sugar melts and begins to brown. Pour seeds into spiced mixture and stir until well coated. Cool before serving. Preheat oven to 350 degrees F. Spray a 9X13 pan with non-stick spray and set aside. Mix together the first 6 ingredients until well mixed, pour batter into pan. Sprinkle cake mix evenly over the pumpkin mixture. Drizzle butter over cake mix and sprinkle nuts on top. Bake for 55 to 60 minutes. This bread is a great way to use up leftover sweet potatoes. 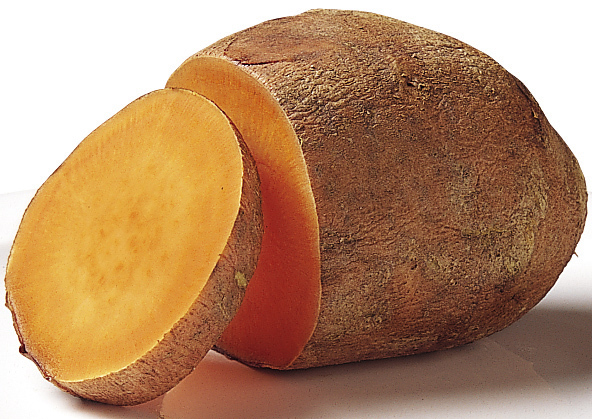 It is also a delicious way to sneak some veggies into a picky eater's diet. Preaheat oven to 350 degrees F. Spray a 9X5 loaf pan with non-stick spray and set aside. In a large bowl, combine sugars and oil. Add eggs and beat until well mixed. In a second bowl, combine flour, baking soda, salt and spices. Alternating flour and water, stir into sugar mixture until just combined. Add sweet potatoes and pecans and stir. Pour into prepared pan and bake 55-60 minutes. Allow to cool in pan 10 minutes before turning out onto a rack to cool completely.